Many of us have got the odd antique and collectible at home that might be a bit tired or broken. You might have asked yourself whether or not it's going to be worth restoring. And if it was, could you then take it to an auction, sell it, and make yourself a bit of money? We're here at magnificent Chatsworth, in the heart of the Peak District. It's the perfect setting for today's Restoration Roadshow and I can't wait to get started. our restorers are going to have their hands full. What everyone wants to know is how much are their treasures worth? -This is the kind of piece that you could spend a fair bit of money on. ..or sent to make money at auction? This is a laptop, although you won't get on the internet with it. If we give him the other foot, he can fight the octopus on an even keel. ..and stumble upon the equivalent of a golden calf. This is very, very unusual to get something like this. Our restoration surgery is open for business and the patients are already lining up. 18th century clocks, headless Doulton figurines, someone's even brought in the family china. There's nothing I can do with it today, I'd have to take that back to my workshop. But there's no time for tea breaks on this programme. which owners, Malcolm and Patricia, are hoping we can rescue. Do you have a great sentimental attachment to it? It came to us 39, 40 years ago from my great aunt. We never really used it for the purpose that it was made. -Let's have a look inside, because all is revealed. Oh, dear, that wasn't a good sound. Have you let the children play with it or something? No. The children have never touched it. It did have a purple velvet on, didn't it? This area here would be for writing your correspondence. These empty spaces would have certainly taken inkwells. 'in most Victorian middle-class homes, especially as letters were the fastest way to communicate. -Now, that's going to cost you some money. -I notice it was your wife that said it. -But it's my money, how's that? In its present state it's probably worth about £80 or something, so it's not a huge amount. So... You've got a decision here. and then sell it, you're not going to be seeing much in the way of a profit. It will never be sold. -So you see you're not sellers, you're curators, aren't you? Furniture restorer Tim Akers has a passion for rejuvenating old furniture. From William and Mary walnut side tables to George the Third bookcases. It's actually in remarkably good condition. Can I have a look, I know it's going to fall-out. That's lovely. We've got a little bit of inlay missing here. Very lucky, really, to have got away with such a small amount of damage. It needs either a new velvet or a leather. extra strength so you don't wear the leather out. -I'll try and replace it with another linen strip. It's worth spending money on. It's a really pretty box. The workmanship in that is fantastic. about between £120 and £130 plus whatever cost of the leather is. In total, Tim's charging around £160. Hypothetically, the chances are that you would never get your money back. But talking to you, that is obviously not the issue. OK, So you are saving it for posterity and for future generations, very noble. I love it when people go the extra mile to save an antique. Especially one as attractive as this. This wonderful but careworn Victorian writing box could maybe fetch £80 in this condition. Tim's going to fix it up for £130 plus the cost of the leather. Restored, we estimate it could only achieve £150 to £200. But this piece has huge sentimental value so it's worth the investment. It's high stakes for Tim, too. Back at antiques A&E, our restorers' healing hands are in high demand. Roman history brought in by Maisey Maudley and her son which, by the looks of it, have been well read. spanning London's V&A to Bucharest Museum Of Art And History. What can you tell me about these books? They belong to my husband. He has had them about 40 years. to smaller accommodation, they had to get rid of their books. It's a lovely set, isn't it? -Tell me how old are the books? So pretty early, aren't they? Lovely condition inside. Lovely paper. As they're over 200 years old, they've acquired a few scars along the way. These corners have become knocked and damaged and they tend to de-laminate. I would consolidate that with a starch paste. Makes it very nice and firm and it will hold together nicely. In their current state they would be worth around £100. But Maisie's keen to sell at auction and wants to know if restoration will up their value. just to do some tidying, some surface tidying, about £80. If they were worked on, they could be perhaps £200. I think we'd be prepared to have them restored. -OK, we'll see what we can do. In their tattered state, this well-thumbed series could fetch £100. which could see them reach £200 at auction. before these weighty tomes can march off to auction. and today we've got plenty in need of our specialist attention. Some just need a bit of spit and polish. It's just household dust and dirt, years of it hanging on a wall. and his extremely angry passenger, brought in by Mary Bagley. It's a Mayday call for our ceramics guru. Roger Hawkins knows a thing or two about ceramics. With over 30 years' experience, he's one of the country's leading authorities. But I suspect he won't have seen many of these before. So tell me, how did you acquire this lovely character? My grandfather gave him to me. -because he desperately wanted to get out of that basket in the back. -He certainly looks like he's in agony. Did your grandfather tell you anything of his origin and where he came from? My grandfather's sister worked out in Hong Kong and she was in a cholera hospital as a nurse. He went out to visit her and that's when he brought this chappy back. So you don't actually know anything about the figure itself, or really where it came from? No, I don't even know whether it's Chinese or Japanese. where they produced a huge range of pottery and porcelain. it's not very pleasing to look at, is he? and his foot's obviously gone for a walk somewhere else. But I could make that foot. I could put that foot pack on properly so that he becomes as good as new. Did you notice that he's missing something here as well? Yes, I don't know what that is. That probably would be a little pouch for his money or little tokens. -So what's the damage in money terms, Roger? The cost of restoration on this would probably, if I had to make that new hand, the foot. Probably somewhere around the £300 mark, unfortunately. -It's just the amount of time and labour in doing it. Sadly, even in perfect condition he probably wouldn't be worth quite that amount of money. probably, let's say between 100 and 150.
very, very sentimentally attached to him to spend that money. But in my opinion, he's worth doing. I'd really love to have him restored. I'm amazed you can actually do something like that and make him whole again. If we give him the other foot then he'll be able to fight the octopus on an even keel. As he is, this unusual 19th century figure would only be worth around £20 to £30. Roger's going to get him back on his feet for £300. wants to pass on to future generations. Roger's going to have his hands full with this tricky opponent. suggesting treatments for your antiques and heirlooms. Every now and then an object arrives that turns out to be a bit of a special breed. Lis Woodehouse has brought in a 19th century oil painting of a short-horned cow. One of three, all painted by the same artist, it's in desperate need of restoration. Our painting restorer is already getting excited. and been a conservator at the Victoria and Albert Museum. It belonged to my mother's grandfather. They were farmers, they're from a farming family. three, the three of them came to light. a renowned painter of cattle and farmers always had their prize cattle painted. and it's a whole wonderful sort of era of painting animals. Gauci's patrons included Queen Victoria and some of his works are worth thousands of pounds. However, this magnificent specimen isn't in prime condition. where we can actually take this from the glass very safely without losing paint. that you don't want to lose the paint. Sounds risky but Lucia thinks this prized beast and his friends could be worth their weight in gold. These are very collectible things and it's very beautifully painted. It's also quite unusual for this period. They're hard to value so Lucia wants to do her homework before putting a price tag on this herd. First she has to tackle lifting that glass. A test that could prove her toughest yet. Today's Restoration Roadshow has thrown up all sorts of challenges for our team of restorers. They're all busily attending to their patients. Remember that Victorian writing box in need of some microsurgery? and has cut tiny sections of boxwood, ebony and mahogany to fill in the gaps. It's fiddly work at the best of times, let alone in this breeze. we then just use a chisel. If I wet it, you can see the natural colours of the timbers that I've chosen. That will trim down and produce the missing piece of parquetry. So I'm pleased that went OK, actually. Now for the writing leather. and can be wiped off without causing damage. The glasses would be a good idea for this so let's go ahead. to where the rebate is underneath. Steady, Tim, mind you don't cut the polished surface underneath. I'm just going to check, that's fine. That's the leather in place. when they're reunited with their writing box later. Here you go, here's your box. Louise has also been busy, skillfully restoring the Charles Rollin Roman History volumes. Popular reading material, judging by their worn covers. I'm just re-laminating these corners that have all become very damaged and soft. and a piece of board either side and that will form an nice rigid repair. I do that on each of the corners. The wheat starch paste Louise is using could stain if she uses too much but she's a dab hand at this. It's one of the most common repairs, actually, on books of this age. They often have very similar damage. That's how they're removed from the shelf. If Louise didn't fix them, they'd deteriorate and the whole cover could be lost. She bandages the repair and gives them all a good polish. It's such a minimal amount of this wax is used. and just apply literally very minimal application of wax. She might not need much but that wax will protect and bring out the colours in the original covers. Let's hope it makes the set more saleable at auction. A really nice set of books. Lots and lots of bidding on it. determined to prove what can be achieved when antiques are given a second chance. like this stunning 17th century panel belonging to Alan and Alison Frater. I like that. That's quite ancient, isn't it? So what have we got? We've got this Cavalier and it's all done on silk. It was probably produced by a teenage girl using patterns bought from a travelling peddler. Which could explain that leopard. Such detailed delicate needle work is highly prized. When it comes to the value of something like this, obviously there's a demand. And this is big and it's dated. I think this would carry an estimate at auction of maybe 12, 14, 1500. And it doesn't really need anything in the way of restoration. It might be over 300 years old but this treasure is best left well alone. The sad thing is that silk does. It's remarkable that it's lasted this length of time. If it was mine, I'd kiss it every day I left the house. It just goes to show that restoration isn't always the answer. Roger's retreated to his workshop where he has everything he needs to make and fit new limbs. It's a long and tense procedure. I had to make completely from scratch. so it all had to be done completely freehand. What I had to do was make sure I got the style right and I didn't really know what the hands looked like. I mean, what was he doing? So there's an element of artistic licence. in an appropriate way that it looks right. With the undercoat done, Roger's next challenge is to colour match our fisherman's new body parts. he will become quite a happy little chappy. but I wouldn't if I had an octopus around my neck. Coming up, Tim's had to battle the elements to get that Victorian writing box finished. I lost one piece in the breeze I just put it down and it flew away. And Lucia's research into that Gauci painting uncovers some surprise results. Louise has been lovingly tending to the war-torn 18th century Roman history series. She's worked on all ten volumes, gluing, bandaging and waxing them back to life. Now it's time to see how they stack up. So, finished the books, just here. Oh, that's splendid, isn't it? -They have. Labels have gone down nicely. -You have done really, really well, haven't you, with that? Before, these tired old leather covers were tatty and torn, hardly fit to house the Roman Empire. will look imperious on the shelves of any book seller. I managed to reattach the head caps which had broken away. And all the corners have been consolidated. -That's very good. That's really super. Very pleased with that. So the Romans are heading off to auction where they should command our bidder's attention. But not everyone wants to sell their heirlooms and our next item is staying put. Earlier, Malcolm and Pat brought in this exquisite Victorian writing box, falling apart at the seams. Tim nearly went cross-eyed trying to fix it so I hope all his hard work pays off. -It was extremely fiddly. The breeze didn't help. I lost one piece in the breeze. I just put it down and it flew away. -I tell you what, I'm blowed if I can see the replacement bits. Can you? -I know where they were. I couldn't tell you. -That's only half the story. Oh, it is. Isn't that lovely? And then when you do this one you just fold it like that. stripped of the wood with chips in its detailed surface. it's the last word in style and elegance. but I also suggested that it might have been worth up to £250 once it was restored. -I would see a price tag on that of at least £300 or £400. So have you had second thoughts? We're not going to do anything with the box, we are going to take it home and treasure it. Put it where it came from, on the bookshelf, between the books. What a rave review. I'd say that was two satisfied customers. Our restorers have seen and treated all sorts of troubled treasures today. but can Roger get him back on his feet? I couldn't take a mould of the right foot so it's all had to be done completely free hand. While the others are of to auction like the Charles Rollin history of Rome books. Where are those book dealers? Remember that water-damaged cow portrait signed by AM Gauci with the paintwork stuck to the glass? Well, when Lucia investigated the damage, her suspicions were confirmed. The conservation job is a real horror. It's not going to lift off. come away with the glass and will be lost forever really. Very sad. the paintings could fetch around £6,000 in their current state. And sell for a hefty £15,000 if restored. It's a fantastic end to a fabulous day. Let's hope we pull in the pounds at auction, too. But first, it's time to catch up with Roger and his Japanese fisherman. When we first saw this lovable 19th century figure he'd really taken a beating. Roger's had to use every creative bone in his body to give him a fighting chance. Well, let's have a look at the end result, shall we? He can now fight off the octopus and a lot easier and he can run away now. Before this embattled pottery figure had a broken arm and a leg missing. this odd couple can be enjoyed for generations to come. It was a pleasure doing it. I really enjoyed working on him. In fact I don't want you to take him home, I want to keep him now. having belonged to her grandfather. because that's really what I'd like to do. Now it's even got another story to tell behind it. So I'll let all my children know about Roger and how creative he's been really. So, Roger's meticulous modelling has paid off and our fisherman lives to fight another day. But will our history books sell at auction? Here at Bamford's auction house in Derby, Maisie's 18th century books are hoping to command and conquer. There's plenty on show today and lots of eager bidders. Hopefully we'll find them a new home. you'll have commission and other charges to pay. Check with the auction house first. like our books which Louise's given a new lease of life to. She tidied them up for £80 and we think they could now fetch £200 at auction. But Maisie and Simon are upping the ante with a £400 reserve. They're obviously impressed by Louise's repairs as so often happens on Restoration Roadshow. But that's double our estimate. -400, so you're of a mind to keep them at that rate? -You really are, I think you're pushing your luck there actually. Let's watch, wait and see and hope the gods are smiling on you today. Roman history and the foundation of Rome to the battle of Actium. London 1768, they're a very, very well-known edition. I can start with me at...£370. 380, do I see in the room first? At 370, 380 do I see? where are you, where's that bid? Take them to bed every night. Oh, really? Oh, right, well, I'll test you later on ancient Rome. Well, Maisie's got a lot of swotting up to do now, I can tell you. place a higher reserve and very nearly made it. 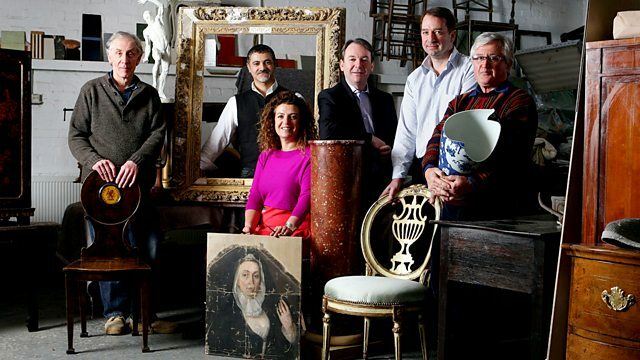 your old antiques could make you a handsome profit at auction. So, until the next time, it's cheerio from Restoration Roadshow. Elegant Chatsworth House is soon witness to some frenetic activity as Eric Knowles and his team of brilliant restorers continue their valiant efforts to save your heirlooms from the ravages of time. Tim Akers does everything he can to revive a wonderful Victorian writing box. Ceramics expert Roger Hawkins grapples with an extraordinary 19th century ornament depicting a Japanese fisherman under attack from an octopus, and Lucia Scalisi meets a totally different beast – a painting of a short horn cow that might carry a very hefty price tag. Elsewhere, paper conservator Louise Drover faces a mammoth task too. She has to resurrect a badly scarred 200-year-old set of volumes charting the history of Rome. But will her efforts be rewarded with success when the books come up for auction?